When I was a wee lass – some 35-ish years ago! – my mom made me the Best Birthday Cake Ever. It was a carousel cake, with carousel ponies all around the edges, topped off with a striped tent over head. I thought it was a magnificent thing! Just dreamy! I’ve always had A Thing for the color and flash of the carousel pony. The carousel is my favorite ride, even now, at any fair or amusement park, especially to take little kids on, or just to watch them enjoying the ride. It’s tame, but it’s fun, and it’s always great for smiles. And there’s nothing better than visiting a city park that has a permanent carousel. Carousels, after all, are happy things! So, when Sarah, a twelve-year-old reader here on Needle ‘n Thread, sent in photos of her recent fair entry – an embroidered carousel pony – I thought sharing it with you would be a cheery way start to the week! 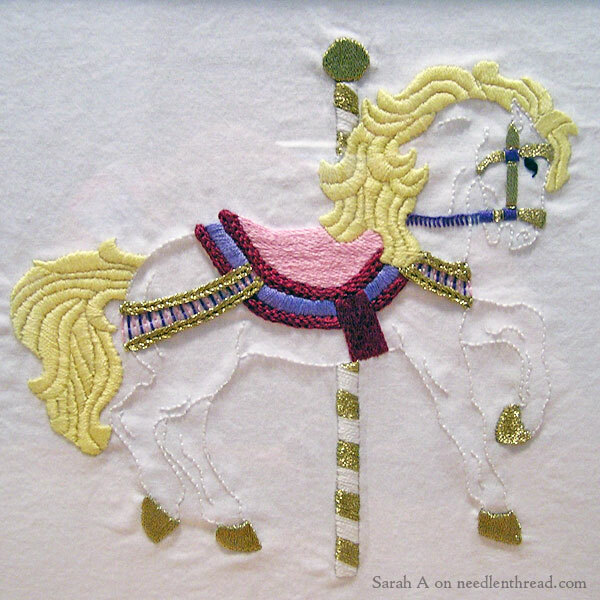 The embroidery on Sarah’s pony is worked with DMC cotton floss and DMC gold metallic floss. She used a good variety of stitches in the piece: padded satin stitch, satin stitch, heavy chain stitch, Hungarian braided chain stitch, backstitch, stem stitch, buttonhole stitch, and straight stitch. The mane and tail are worked entirely in padded satin stitch – a terrific undertaking! The bridle and some of the harness accents and the pole are all fitted out with metallic floss, for a little sparkle. Sarah said she found the gold metallic floss easier when working with one strand (the details on the pole and the bridle), instead of three strands at a time (the heavier chain stitching on the harness). This was her first time working with metallic floss, so I think she’s well initiated now. The saddle is worked in stem stitch filling and trimmed out with Hungarian braid stitch and satin stitch. 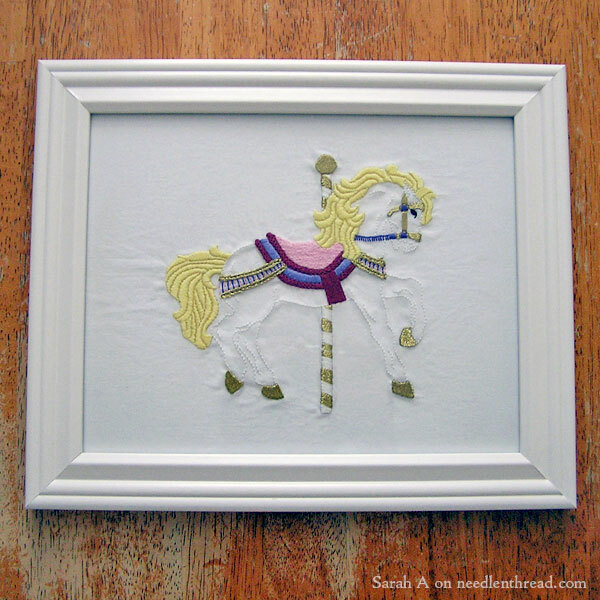 The pony took Sarah two months to complete, at which point she pressed it and framed it. Then she took it off to the county fair, where it won Best in Class, and where it was chosen to go on to the State Fair. I think she did a great job! It looks like it was a fun project and a good learning experience all around, and of course, it’s super encouraging to see young people stitching and loving it! Like I said, a great way to start the week – have a Magnificent Monday! Would you like to be part of the Reader’s Embroidery series on Needle ‘n Thread? If you’d like to contribute for future articles featuring your own embroidery, write to me at mary(at)needlenthread(dot)com and tell me about your project. You can attach photos of your work right to your email. If you have a blog or website, a Facebook page or Pinterest board that you’d like to share with everyone, feel free to include that information as well. A great piece of embroidery well done Sarah, I love the horses maine and tail and I like the gold metallic thread used it really blends in nicely with the piece and your satin stitch is perfect, I’m not surprised you won first prize I hope you win at the State Fair. It’s lovely to see young people involved in needlework and I hope you continue in your new hobby. Thank you Mary for sharing Sarah’s Carousel Pony it’s certainly is a great way to start the week. Wow !!! That’s a beautiful pony. Love the way the heavy work on mane, tail and saddle have been contrasted with the light back stitch on the body! and it’s great to know that this comes from a creative 12 year old Sarah. All the very best to Sarah! And thanks Mary for sharing it with us, this truly is a very good start to the week!!! WOW, I am impressed! What a beautiful job she did! I bet whoever taught her is extremely proud of her achievement. I’m so glad she won Best in Class at the fair. What a way to start out! Awesome job! Love the horse! Keep up the great work! Good Luck at state…..You have a great teacher helping you I am sure they are proud of you! Cheers to you, Sarah! This is a fun project, and your stitching is meticulous. 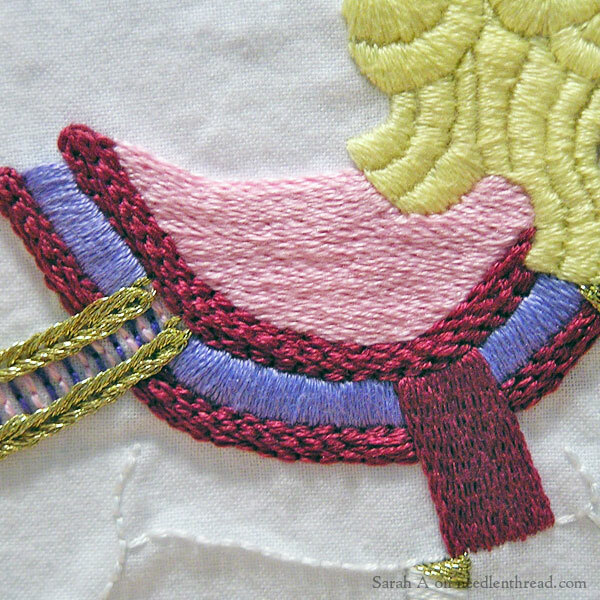 Three strands of metallic thread are definitely not easy to work with, and your patience and perseverance are obvious. Well done, you! Thanks so much for sharing, Mary–both this story and your expertise! Oh, that is terrific! Great detail work; great use of stitches, love the white backstitch for the outline. Very good job! Excellent work, Sarah! Congratulations, and good luck with the State competition. Stick with it, and by the time you are 20 you will be teaching the rest of us how it’s done! I agree Monica. But never mind when she’s 20. She certainly has a thing or two she could teach me right now! Beautiful work Sarah! Congratulations. You obviously have a great instinct when working a design. I hope to see more of your work in the future. Fantastic stitching Sarah! Congratulations! Thank you for sharing and brightening our day. Well done Sarah! That was quite an undertaking and beautifully done. I love the gold accents. Sarah’s carousel pony is fantastic! About the only thing I would have done different would have been to put it on a slightly darker fabric. I chose anything but white when given the chance. Sarah, that is Gorgious! I don’t think I would have the patience you have. I already know I don’t have the skill. And just an aside to Mary re: Stephen King, you are so right!! Congratulations, Sarah! What a wonderful finish. The fact that you were able to deal with the dreaded DMC metallics is even more impressive! Good luck at the State Fair. Ah, the dreaded DMC metallics… they certainly were an undertaking! Sarah, it is simply beautiful! It looks lovely. That is absolutely fabulous! Well done, Sarah. I doubt if there are many 12 year olds these days who could embroider half as well as you. Keep it up! WOW! Congratulations Sarah!! I’m so impressed with your embroidery skills, you must be very proud of this gorgeous piece. Best of luck at the State Fair! Delightful! And beautifully stitched! It would be lovely to see it in person. Mary, can you tell us in which state fair it will be shown? Sarah your work is just wonderful, amazing that a twelve year old has so much skill. Good Job Sarah and good luck at the State Fair. Mary let us know how well Sarah does at State and what State it is in…………. Congratulations Sarah!! What an amazing piece of embroidery you have done.. You are very talented and should be very proud. My goodness, I don’t know what to say. Thank you so much, everyone, for all your lovely comments… my heart does swell with pleasure and delight in reading them! I’m so glad all of you like it… I really can’t stop smiling right now! The state fair is over and I got an Award of Excellence; currently I’m busy with school and not working on any major stitching. But be assured, I’m not going to stop any time soon! Carousel and Ferris wheel – the only two carnival rides I’ll go on! Cute design and very good work! And, please note, I’m not saying “very good work for a beginner” or “for a kid.” Sarah’s embroidery is very well done. I’ve been thinking about stitching a Ferris Wheel sometime in the future. Carousels and Ferris Wheels are my two favourite carnival rides too! They’re the good, old-fashioned ones :). Just georgous, Sarah! Congratulations on winning and all the best for the State Fair. To be honest, your stitching is a lot neater than mine, especially your padded satin stitch! You inspire me to do better and to work at improving my own stitching. Thanks Mary for sharing Sarahs’ beautiful work with us. Congratulations, Sarah! What an artistic eye you have. Keep up the beautiful work. Wonderful work, Sarah! Thank you so much for sharing it with us. Fantastic work, Sarah. Thank you Mary for showing it to us. I agree with other commenters that it is great to see young people so passionate about embroidery. I would like to think that I might have done work this good at age 12 but the truth is I was too busy being a rebel to sit down and concentrate on anything as “square” as embroidery, to my undying shame. Keep up the good work Sarah, I really admire you. Its so pretty and beautifully stitched! 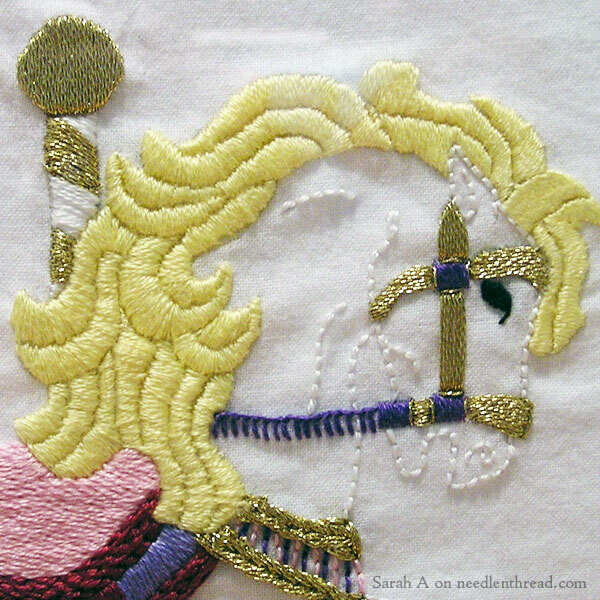 Sarah, your carousel pony is very pretty but your stitching – WOW! No wonder it won best in fair, you certainly haven’t shied away from the more difficult techniques and threads. Absolutely lovely work. Thank you for sharing it with us. That’s incredible! 12 years old?! I couldn’t pull off something so complex and I’m much….more advanced in the aging process. What a beautiful embroidery! A needleworker of any age would be proud of this; for someone as young as Sarah it is just astonishingly well done. Congratulations to you Sarah on a magnificent embroidery. This is so charming. For me it is specially relevant, because my grand daughter Marthe is seriously in to “My Little Pony”. Your timing is excellent! Thank you. Mary, I’ve been trying to contact you regarding your monogram ebook. My EGA chapter would like to use it for a workshop. Can you supply me with some additional info as to how we can make that work? Hi, Holly! Can you email me at mary(at)needlenthread(dot)com? We can follow up on email. Thanks a bunch! Well done and congratulations to Sarah! Your stitching is lovely and well executed! I hope you will enjoy many more years of stitching and creativity. Sarah obviously has a great career in embroidery ahead of her. It’s wonderful to see someone so young being interested in the art, much less doing so well with it. Congratulations Sarah!! My wee lass days were more like 50 years ago, but I remember a home ec class (I don’t think they do those any more) where I had to do a little embroidery. I did so poorly that it put me off embroidery for the next 40 years. She did a terrific job. I’m very late to comment but had to say something as it is such a lovely piece. The padded satin stitch is very effective for the mane and tail too. I’ve been in Ark. and couldn’t respond. What lovely work and what fun to see. Sarah, keep it up, you are doing such beautiful work. Doing this sort of thing will give you a lifetime of joy and also be something you can enjoy sharing with others throughout your life. Thank you Sarah and Mary, for sharing. Previous Previous post: A Shisha Tutorial with a New Foundation!